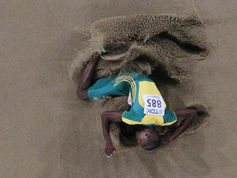 Since winning the silver at the Rio Olympics, everybody loves South African long-jumper Luvo Manyonga. That wasn’t always the case, as pointed out by journalist Luke Alfred in his poignant 2014 piece “Luvo Manyonga jumps or dies”. Manyonga, it appeared after testing positive for recreational methamphetamine use in 2012, was destined to become another promising young person lost to –- and I paraphrase – “the demon scourge of drugs”. Instead, the prodigal son returned, with a silver medal in hand. His is an example for other young people. If we are to believe the popular press and social media commentators, drugs can ruin your life and hard work and abstinence will be rewarded. Without a doubt, this young man has achieved something remarkable, but we need to be careful as to how we frame this narrative. There is a mantra that originated in 12 step programmes that drug use leads to jails, institutions or death. Like many of his peers, Manyonga could easily have ended up in jail. In reality, jails are largely the consequence of policy and stigma. They are a consequence because we have criminalised drug use. And institutions because unmet treatment needs mean that people with psychiatric disorders may end up using drugs in an attempt to self-medicate. The third consequence is death because drug users are stigmatised and do not have equal access to health services, increasing their risk for infectious diseases. They are marginalised, often live in squalid conditions, or suffer the consequences of impure or variable doses of drugs. All are consequences of prohibition. Apparently Manyonga was, by his own interpretation, “near death”. The fact is that the data from population studies shows that the vast majority of drug users (99,2% in the case of cocaine for example) will resolve their drug use issues. Death from drugs is the exception. This doesn’t mean that a literal or metaphorical death was not awaiting Manyonga, or others like him. The prospects for any young person in a South African township are severely limited. There are few employment opportunities, especially for someone who has not completed high school. The impact of apartheid cannot be understated: communities were displaced and dispossessed, narrative histories destroyed and families split. All of this has led to high levels of psychosocial dislocation, which, as renowned psychology professor Bruce Alexander has convincingly argued, leads to higher levels of drug use and addiction. Many of the headlines and articles refer to Manyonga’s drug of choice (“tik” or methamphetamine) as a “demon”. Well, for many it is a saviour. A lifetime of uncertainty, instability and little hope for the future makes drug use a very attractive option. The instant short-term gains far outweigh the long-term consequences – this is normal human behaviour heightened by circumstance – of picoeconomics, or micro-micro-economics, which explores the implications of an experimental discovery. American psychiatrist, psychologist and behavioural economist George Ainslie explains it in “Breakdown of Will”. In a world of uncertainty and unemployment, drug use provides consistency and vocation. We know that social status influences D2/3 receptor availability in primates and humans, making drug use and the artificial increases in dopamine all the more attractive. The increased salience of drug use is not a function of pharmacology, but a function of circumstance, as drug policy specialist Professor Paul Hayes has previously discussed. The point is that drugs (tik or otherwise) are not the “demon”. If there is a demon, it is inequality and lack of opportunity. Not only does inequality lead to increased levels of drug use, but it also significantly increases the consequences. Drug users from the privileged (usually white) communities around the globe suffer far fewer consequences related to drug use than the economically marginalised (usually black or other-than-white) communities. Michelle Alexander describes the “war on drugs” as a form of racial control in her book “The new Jim Crow: Mass incarceration in the age of colorblindness”. In South Africa the “war on drugs” is still used to justify continued apartheid-style policing. In many township schools pupils who test positive for cannabis are immediately suspended, increasing their risk. Police conduct raids with sniffer dogs. Random searches are common, and the approach to complex social issues is primarily a criminal justice one. When caught, people from these communities are arrested and criminalised. They are not sent to R1000-a-day (approximately $75) rehabs like many of the more privileged drug users. Although funds have been made available to the athlete for purposes of participation, this in itself is not sufficient to provide a sound basis for a young athlete to manage a lifestyle that he is not accustomed to. He is young and immature and whilst he has needed professional guidance, these institutions have failed him. In a similar way society has failed the majority of the people who live in the same circumstances. But Manyonga was fortunate. He overcame his circumstances because he had a talent and that motivated some people to invest time and money in him. First Mario Smith, an athletics coach from Stellenbosch, spotted him and nurtured his talent. Then, even though things were not going well, John McGrath, a former Irish rower-turned conditioning coach, took “a punt”, and kept going even after Smith was killed in a car accident and Manyonga couldn’t even find a sponsor for spikes. 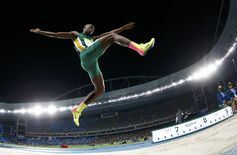 Eventually Sascoc president Gideon Sam stepped into right some of the previous wrongs and helped Manyonga secure a place at the High Performance Centre in Pretoria, far from the chaos of his home of Mbekweni township. This is exactly what Smith and McGrath did. They gave a future champion the image of himself as a future champion. And they nurtured him through good and bad. And now it has paid dividends. From this, we could learn a lot about how our current policies and structures contribute to the burden of drug use in our communities. But that is not the real story. To reduce Manyonga’s achievements to a victory over the imagined demon of drugs is to devalue his immense talent and the vital role that those who have helped him played. More importantly, it is to fail to appreciate a set of broader policies and structural barriers that marginalise so many people to the extent that many people have, as McGrath noted, only two choices: Jump or die. And we know that very few have the talent to jump like Manyonga.